Your key to powerful IBM i mobile & web apps. Easily. 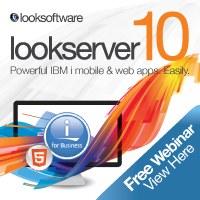 Deliver the full power of your IBM i core business applications without limits, to the right user, on the right device with Lookserver 10. Lookserver 10 immediately creates high quality web applications from your existing IBM i solutions. No matter their language, package or age. "We have different users with different requirements and device types. Lookserver 10 allows us to deliver the right interface with minimal effort."